I have a holiday looming, and the sun had briefly decided to show it’s face (about time too, might I add) and yes, these are both wonderful things. The downside is that I can no longer rely of thick black tights and jeans to hide my pasty legs. So I’m guessing my winter routine of shaving my legs once a week is out too? Last year I really got into epilating my legs, yes – despite the discomfort it really is an amazing way of getting long lasting hair-free legs. But I didn’t find that the finish was quite as smooth as it is when just-shaved. So one weak moment mid-winter and I returned to shaving and currently haven’t returned to the epilator (although I am really considering a return to the epilator – having to de-fuzz once a week is so much easier than almost daily). I have been using a variety of Gilette Venus razors and shaving foam as a first (small step) towards feeling bikini ready. Am I 100% ready for a bikini yet? Hell no. But I might consider some slightly cropped jeans. Or maybe a skirt. The best bit that I wanted to share with you is that I have found that any gilette venus razors fit on any of the razor handles. I picked up some Gilette Venus Divine razors and some Gilette Venus Embrace razors and they all fit onto the handles that I have at the moment. To be fair, it does say this on the Gilette Venus website – but it’s not something I’ve ever checked on before (other than on twitter…) and when standing in front of the refill section in Boots contemplating if I want ‘Embrace’ or ‘Diva’ and trying to remember if my razor handle was blue, turquoise or purple…. it’s good to know that I can just pick whatever and it will work. It’s also good as it means you don’t need to buy a new set each time they release a new one. 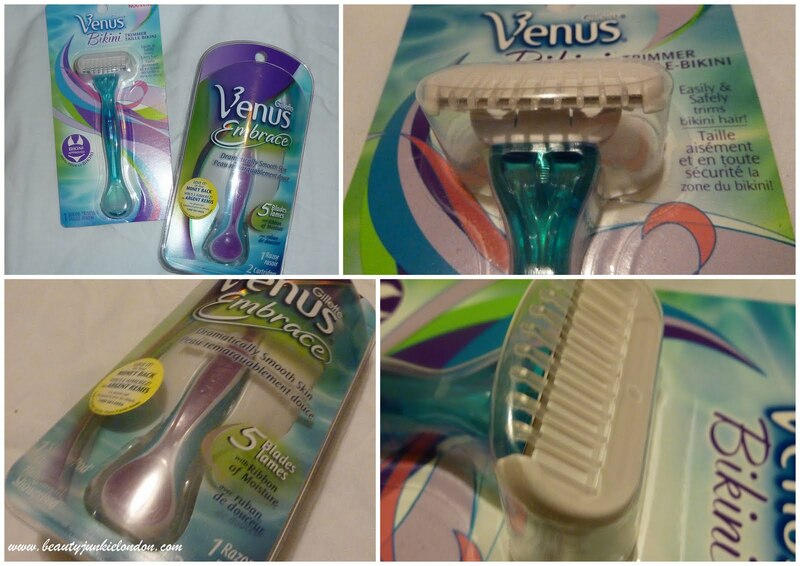 The other latest member of the Gilette Venus family is the bikini trimmer – which I actually think is really refreshing as a trimmer rather than a total hair-remover. It’s nice to see that not every aspect of hair removal is making total-baldness ‘down there’ an essential part of the de-fuzz routine for everyone. I think it should be a personal choice thing rather than based on pressure, assuming that everyone else out there is hair free. The trimmer means you can neaten things up without going full monty. If you dare to wax or epilate such sensitive areas then the trimmer is a good way to make sure the hair is a better length (longer the hair for waxing & epilating the more it hurts). You can see what the trimmer looks like in the pic above – the razor head is a razor covered by a plastic comb to keep the skin protected and the hair at a consistent length. So for now, the razor is my friend. It’s hard to beat as a quick, easy hair removal method but the regrowth is the only off putting thing. When it comes to hair removal for the armpits, I’m pretty sure I will be 100% loyal to shaving for life. I cannot stand the idea of waxing or epilating there! What do you think about hair removal options?? Preference? Razors pictured are PR samples. Replacement blades mentions bought by me.